One of the most absurd developments in the past nearly nine years now is the extent to which former critics of Joseph "Cardinal" Ratzinger attempted to transform him into a veritable "restorer of Tradition" once he, as "Benedict XVI," had met at Castel Gandolfo with Bishop Bernard Fellay, the Superior General of the Society of Saint Pius X, on August 29, 2005, the Feast of the Beheading of Saint John the Baptist, and especially after the issuance of Summorum Pontificum on July 7, 2007. Only the willfully blind in the Motu blogosphere could ignore Ratzinger/Benedict's frank discussion of the reason he issued Summorum Pontificum. Ratzinger/Benedict was not personally devoted to the Immemorial Mass of Tradition as it enshrined a Faith, including an ecclesiology, that was counter to the alleged "needs" of his mythical "modern man." He desired there to be a "synthesis" between the Missal of Pope Saint Pius V and that of the very unblessed Giovanni Montini/Paul The Sick. Yet it is that the "strategists" in the "resist while recognize" movement chose to ignore their "restorer of Tradition's" multiple defections from the Catholic Faith during his 2,873 days as the universal public face of apostasy that were summarized (mind you, only summarized) eleven months ago in Mister Asteroid Is Looking Pretty Good Right About Now. The omissions of fact from their newspapers and websites are glaring as they knew that their "pope's" defections from the Faith, which were identical to the ones for which they had criticized Karol Wojtyla/John Paul II with relentless fury, were indefensible. Jorge Mario Bergoglio is only a cruder, more vulgar, profane and visceral popularizer of the conciliar revolution than the supposedly "erudite" Hegelian, Joseph Ratzinger/Benedict XVI. Most of differences between the two are matters of style and emphasis, not substance, as each man is but a total creature of the conciliar revolution. Ratzinger/Benedict was one of its progenitors. Bergoglio is its child and current propagator. Consider the fact that Ratzinger/Benedict committed Mortal Sins against the First Commandment every time he put into question or has denied a dogma of the Faith or has praised a false religion or has entered a temple of false worship. He has done so every time he has staged the Protestant and Masonic Novus Ordo liturgical service. Anyone who denies that entering into and treating with respect places of false worship without seeking the unconditional conversion of those adhere the devils worshiped therein is intellectually dishonest or bereft of the sensus Catholicus (thereby lacking any knowledge of the necessity of defending the honor and glory and majesty of the Most Blessed Trinity) or is a coward who is afraid to speak to the truth of the Faith for one reason or another. Yet is to most Catholics that those of us who reject the legitimacy of these spiritual robber barons are considered to be a source of scandal! Amazing irrationality and illogic. The true scandal is that the former head of the counterfeit church of conciliarism could enter into Talmudic synagogues and to listen without complain to a Talmudic hymn speaking of the "waiting" for the Messiah as he is treated as an inferior. The true scandal is that the former head of the counterfeit church of conciliarism took off his shoes and entered Mohammedan mosques, even going so far once as to assume the Mohammedan "prayer" position as he turns in the direction of Mecca. The true scandal is that the former head of the counterfeit church of conciliarism referred to a mountain in Japan, Mount Hiei, upon which the Tendei sect of Buddhism worship their devils, as "sacred." Or, that the idol is any thing? But the things which the heathens sacrifice, they sacrifice to devils, and not to God. And I would not that you should be made partakers with devils. Those who turned a blind eye to Ratzinger/Benedict's multiple defections from the Catholic Faith during his 2,873 days in office knew that these things are true. Some even know that the Protestant and Masonic Novus Ordo liturgical service is evil. They know know that the nature of dogmatic truth cannot be explained away by the absurd and dogmatically condemned thesis contained in Ratzinger/Benedict's "hermeneutic of continuity and discontinuity." They know that the conciliar "popes" have abandoned the Catholic Church's mission to seek with urgency the unconditional conversion of all men to her maternal bosom. They know that Our Blessed Lord and Saviour Jesus Christ is meant to reign as the King over men and over nations. Most of those who consider themselves to be the "gatekeepers" of traditionalism, however, were content to keep their mouths shut about the apostasies and sacrileges and blasphemies that they saw emanating from Ratzinger/Benedict in order not to "jeopardize" Summorum Pontificum. Things are supposedly "different" now that Jorge Mario Bergoglio, whom some of the same "gatekeepers" who kept their mouths shut about Ratzinger/Benedict after having criticized him during his twenty-three and one-half year tenure as Wojtyla/John Paul II's prefect of the so-called Congregation for the Doctrine of the Faith, has "wounded" Summorum Pontificum and has engaged in the same kind of "papal" extravaganza liturgies as had the soon-to-be "canonized" Polish "pope" had pioneered from October 16, 1978, to April 1 or 2 (depending upon which date he actually died), 2005. Some, such as "Father" Paul Kramer, have concluded that Bergoglio's open heresy about the "permanent validity" of the Mosaic Covenant make him a false claimant to the Throne of Saint Peter while Ratzinger/Benedict, who believed and professed publicly, both by words and symbolic gestures, the exact same heresy is "orthodox" in doctrine and was "forced" to resign the conciliar "papacy," making Ratzinger/Benedict still the "legitimate" conciliar "pontiff." Such must be the absolute, patent absurdities to which those who cannot bear to admit that the "crazies" who adhere to sedevacantism might be correct and that they, the sedevacantists, are not the problem facing the Church Militant in this time of apostasy and betrayal. 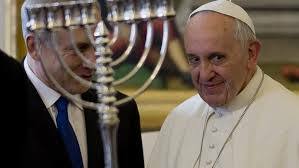 It is to try to discredit this delusional belief that this series of relatively brief articles is being launched, focusing first on Bergoglio's open heresy about the Jews, contained in Evangelii Gaudium, November 26, 2013, in order to demonstrate that Joseph Ratzinger/Benedict XVI believes the exact same heresy. When he came among you for the first time, as a Christian and as Pope, my Venerable Predecessor John Paul II, almost 24 years ago, wanted to make a decisive contribution to strengthening the good relations between our two communities, so as to overcome every misconception and prejudice. My visit forms a part of the journey already begun, to confirm and deepen it. 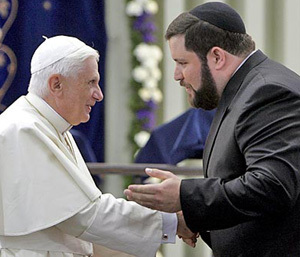 With sentiments of heartfelt appreciation, I come among you to express to you the esteem and the affection which the Bishop and the Church of Rome, as well as the entire Catholic Church, have towards this Community and all Jewish communities around the world. 2. The teaching of the Second Vatican Council has represented for Catholics a clear landmark to which constant reference is made in our attitude and our relations with the Jewish people, marking a new and significant stage. The Council gave a strong impetus to our irrevocable commitment to pursue the path of dialogue, fraternity and friendship, a journey which has been deepened and developed in the last forty years, through important steps and significant gestures. Among them, I should mention once again the historic visit by my Venerable Predecessor to this Synagogue on 13 April 1986, the numerous meetings he had with Jewish representatives, both here in Rome and during his Apostolic Visits throughout the world, the Jubilee Pilgrimage which he made to the Holy Land in the year 2000, the various documents of the Holy See which, following the Second Vatican Council’s Declaration Nostra Aetate, have made helpful contributions to the increasingly close relations between Catholics and Jews. I too, in the course of my Pontificate, have wanted to demonstrate my closeness to and my affection for the people of the Covenant. I cherish in my heart each moment of the pilgrimage that I had the joy of making to the Holy Land in May of last year, along with the memories of numerous meetings with Jewish Communities and Organizations, in particular my visits to the Synagogues of Cologne and New York. There is no space between Ratzinger and Bergoglio on the matter of the "enduring nature" of the Mosaic Covenant. To this, good readers, I say the following: SO WHAT? 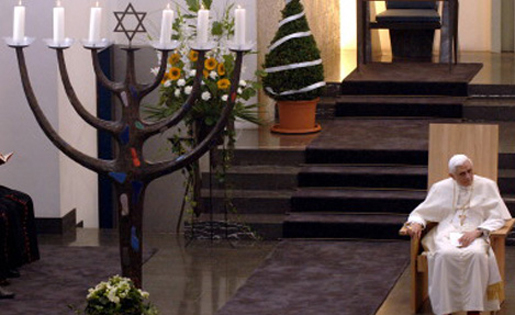 Receiving the "shofar," Cologne, Germany, August 19, 2005. 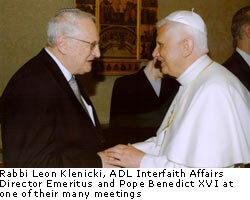 August 27, 2007:: Joseph Ratzinger/Benedict bestowed "papal" knighthood upon the pro-abortion, pro-perversity Rabbi Leon Klenicki. (see Continuing to Knight Infidels). 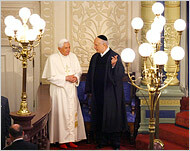 Ratzinger/Benedict at the Park East Synagogue, New York, New York, Friday, April 18, 2008. What's that about a picture being worth a thousand words? Rome Synagogue, Sunday, January 17, 2010. 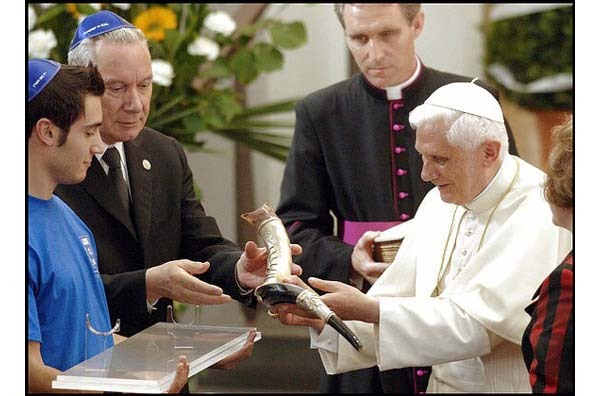 It was a little over a year after the visit to the Rome Synagogue that Ratzinger/Benedict issued Jesus of Nazareth: Holy Week: From the Entrance into Jerusalem to the Resurrection, which contained the following piece of apostasy concerning "Israel's mission:"
Ratzinger/Benedict was saying here, whether or not he realized it, that the Third Person of the Most Blessed Trinity, God the Holy Ghost kept a "correct understanding" of "Israel's mission" deep in the shadows as he pats himself on the back for being one of the "enlightened" Catholics to have "rediscovered" this "true meaning" in order to bring to the world's attention. 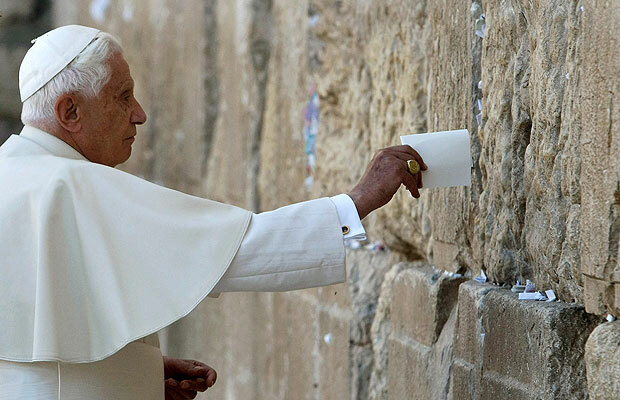 The conciliar "popes" have indeed gone to great efforts to be loved by the Jews, who are simply not of God, demonstrating that they, the conciliar "popes" cannot possibly love God as He has revealed Himself to us exclusively through His true Church that he founded upon the Rock of Peter, the Pope. This effort to be liked and respected and understood by the Jews, who are not of God, has been justified in an effort to oppose "secularism," a contention that is preposterous as it is the very forces of Judeo-Masonry that have resulted in the anti-Incarnational, religiously indifferentist civil state of modernity that has been a vessel out which has flowed every poison of naturalism imaginable. There is simply no "space" whatsoever between Ratzinger and Bergoglio on the matter of the "validity" of the Talmudic religion. This is our duty as Catholics. We are not to support the lords of conciliarism who want to be loved by the Jews, who are of this world and are thus not of God. We are not to support the witting or unwitting dupes of naturalism in the blathering world of talk radio and cable television. We are to stand for the rights of Christ the King openly and unapologetically without fear of the consequences as we pray very fervently for the conversion of those who adhere to the Talmud and as we bear ourselves kindly toward those of their number whose God's Holy Providence places in our paths, providing them with truly blessed Green Scapulars as we pray "Immaculate Heart of Mary, pray for us now and at the hour of our death" for each of them by name without fail every day. God wills the good of all men, the ultimate expression of which is the salvation of their immortal souls as members of the Catholic Church. It is not act of true Charity to reaffirm one in a false religion by acts of omission or commission. Indeed, it is a dereliction of our duties as Catholics not to perform the Spiritual Works of Mercy for those who are in the grip of the devil evil though they may not realize it themselves. We must remember, however, that the Pharisees of Our Lord's day did not act on their own. Our own sins, having transcended time, played a large role in motivating them to act as they did in hating the very One Who had created them and was about to redeem them so that they could be sanctified as members of His Catholic Church. We play the part of those very same Pharisees whenever we turn away from Our Lord and His true Church by means of sinful thoughts, words, desires and deeds. We play the part of the adherents of the Talmud today when we refuse to speak as Catholics in public life and when we plunge headlong in the traps of naturalism posed by the devil as we spend time listening to the babbling inanities of naturalists rather than praying more Rosaries as Our Lady requested of Jacinta and Francisco Marto and Lucia dos Santos ninety-four years ago now. No one has anything to gain, humanly speaking by recognizing that the conciliar "popes" are apostates and their liturgical rites are sacramentally barren and offensive to God and their doctrines have been condemned repeatedly by the authority of the Catholic Church. Yes, it is good to suffer for one's sins. It is necessary to do so in order to save one's soul. One does not embrace the truth in order to suffer, though, as that suffering will find him in due course. Sedevacantists compose only a handful of mostly warring tribes. They are not the problem facing Holy Mother Church in this time of apostasy and betrayal. Just take a look at the evidence presented above if you believe that I am mistaken. We turn, as always to Our Lady, who holds us in the crossing of her arms and in the folds of her mantle. We must, as the consecrated slaves of her Divine Son, Our Blessed Lord and Saviour Jesus Christ, through her Sorrowful and Immaculate Heart, pray as many Rosaries each day as our states-in-life permit, trusting that we might be able to plant a few seeds for the Triumph of that same Immaculate Heart. We may not see until eternity, please God and by the graces He sends to us through the loving hands of His Most Blessed Mother, the fruit of the seeds we plant by means of our prayers and penances and sacrifices, given unto the Most Sacred Heart of Jesus through the Immaculate Heart of Mary. We must remain confident, however, that Our Blessed Lord and Saviour Jesus Christ wants to us, as unworthy as we are, to try to plant a few seeds so that more and more Catholics in the conciliar structures, both "priests" and laity alike, will recognize that it is indeed a sin to stand by He is blasphemed by Modernists, that He--and His true priesthood--are to be found in the catacombs where no concessions at all are made to conciliarism or its wolves, whether their names be Roncalli or Montini or Luciani or Wojtyla or Ratzinger or Bergoglio, in shepherds' clothing.